BASAGLAR® is indicated to improve glycemic control in adults and pediatric patients with type 1 diabetes mellitus and in adults with type 2 diabetes mellitus. 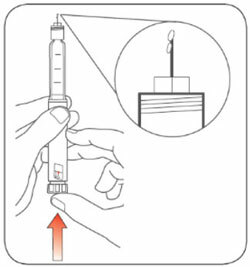 Train patients on proper use and injection technique before initiating BASAGLAR. Visually inspect BASAGLAR KwikPen for particulate matter and discoloration prior to administration. Only use if the solution is clear and colorless with no visible particles. Inject between 1 and 80 units per injection. 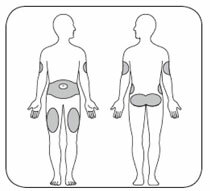 Administer BASAGLAR subcutaneously into the abdominal area, thigh, or deltoid, and rotate injection sites within the same region from one injection to the next to reduce the risk of lipodystrophy [see Adverse Reactions (6.1)]. Use BASAGLAR with caution in patients with visual impairment that may rely on audible clicks to dial their dose. Do not dilute or mix BASAGLAR with any other insulin or solution as the onset of action or time to peak effect of BASAGLAR and the mixed insulin may be altered in an unpredictable manner. Do not administer intravenously or via an insulin pump because this could result in severe hypoglycemia. In patients with type 1 diabetes, BASAGLAR must be used concomitantly with short-acting insulin. Inject BASAGLAR subcutaneously once daily at any time of day but at the same time every day. Individualize and titrate the dosage of BASAGLAR based on the individual's metabolic needs, blood glucose monitoring results and glycemic control goal. Dosage adjustments may be needed with changes in physical activity, changes in meal patterns (i.e., macronutrient content or timing of food intake), during acute illness, or changes in renal or hepatic function and should be made under medical supervision with appropriate glucose monitoring [see Warnings and Precautions (5.2)]. 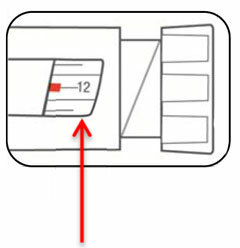 The BASAGLAR KwikPen dials in 1 unit increments. The recommended starting dose of BASAGLAR in patients with type 1 diabetes should be approximately one-third of the total daily insulin requirements. Short- or rapid-acting, pre-meal insulin should be used to satisfy the remainder of the daily insulin requirements. The recommended starting dose of BASAGLAR in patients with type 2 diabetes is 0.2 units/kg or up to 10 units once daily. One may need to adjust the amount and timing of short- or rapid-acting insulins and dosages of any anti-diabetic drugs. If changing patients from another insulin glargine product, 100 units/mL, to BASAGLAR, the dose of BASAGLAR should be the same as the other insulin glargine product, 100 units/mL, and the time of day for administration should be determined by the physician. If changing patients from a once-daily insulin glargine product, 300 units/mL, to once-daily BASAGLAR, the recommended initial BASAGLAR dosage is 80% of the insulin glargine product, 300 units/mL, dose that is being discontinued. This dosage reduction will lower the likelihood of hypoglycemia [see Warnings and Precautions (5.2)]. If changing from a treatment regimen with an intermediate- or long-acting insulin (other than an insulin glargine product, 100 units/mL) to a regimen with BASAGLAR, a change in the dose of the basal insulin may be required and the amount and timing of shorter-acting insulins and doses of any anti-diabetic drugs may need to be adjusted. If changing patients from twice-daily NPH insulin to once-daily BASAGLAR, the recommended initial BASAGLAR dosage is 80% of the total NPH dosage that is being discontinued. This dosage reduction will lower the likelihood of hypoglycemia [see Warnings and Precautions (5.2)]. During episodes of hypoglycemia [see Warnings and Precautions (5.3)]. In patients with hypersensitivity to insulin glargine or one of its excipients [see Warnings and Precautions (5.5)]. 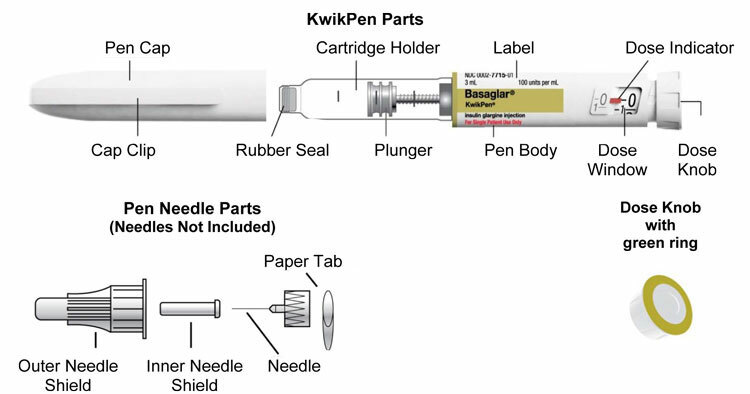 BASAGLAR KwikPens must never be shared between patients, even if the needle is changed. Sharing poses a risk for transmission of blood-borne pathogens. Changes in insulin strength, manufacturer, type, or method of administration may affect glycemic control and predispose to hypoglycemia [see Warnings and Precautions (5.3)] or hyperglycemia. These changes should be made cautiously and only under close medical supervision, and the frequency of blood glucose monitoring should be increased. For patients with type 2 diabetes, dosage adjustments of concomitant anti-diabetic products may be needed. Hypoglycemia is the most common adverse reaction associated with insulins, including BASAGLAR [see Adverse Reactions (6.1)]. Severe hypoglycemia can cause seizures, may be life-threatening or cause death. Hypoglycemia can impair concentration ability and reaction time; this may place an individual and others at risk in situations where these abilities are important (e.g., driving or operating other machinery). BASAGLAR, or any insulin, should not be used during episodes of hypoglycemia [see Contraindications (4)]. The risk of hypoglycemia after an injection is related to the duration of action of the insulin and, in general, is highest when the glucose lowering effect of the insulin is maximal. As with all insulin preparations, the glucose lowering effect time course of BASAGLAR may vary in different individuals or at different times in the same individual and depends on many conditions, including the area of injection as well as the injection site blood supply and temperature [see Clinical Pharmacology (12.2)]. The risk of hypoglycemia generally increases with intensity of glycemic control. Other factors which may increase the risk of hypoglycemia include changes in meal pattern (e.g., macronutrient content or timing of meals), changes in level of physical activity, or changes to co-administered medication [see Drug Interactions (7)]. Patients with renal or hepatic impairment may be at higher risk of hypoglycemia [see Use in Specific Populations (8.6, 8.7)]. The long-acting effect of BASAGLAR may delay recovery from hypoglycemia. Accidental mix-ups between insulin glargine product, 100 units/mL, and other insulins, particularly rapid-acting insulins, have been reported. To avoid medication errors between BASAGLAR and other insulins, instruct patients to always check the insulin label before each injection. Severe, life-threatening, generalized allergy, including anaphylaxis, can occur with insulin products, including BASAGLAR. If hypersensitivity reactions occur, discontinue BASAGLAR; treat per standard of care and monitor until symptoms and signs resolve [see Adverse Reactions (6.1)]. 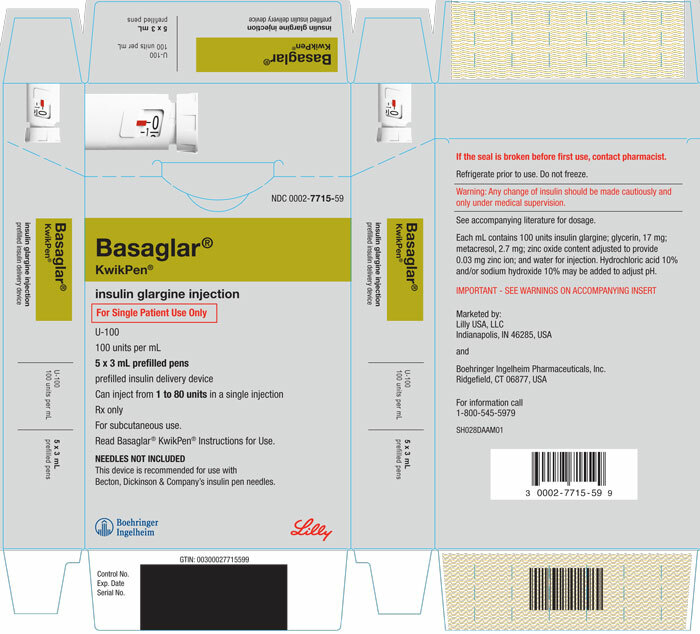 BASAGLAR is contraindicated in patients who have had hypersensitivity reactions to insulin glargine or one of the excipients [see Contraindications (4)]. All insulin products, including BASAGLAR, cause a shift in potassium from the extracellular to intracellular space, possibly leading to hypokalemia. Untreated hypokalemia may cause respiratory paralysis, ventricular arrhythmia, and death. Monitor potassium levels in patients at risk for hypokalemia if indicated (e.g., patients using potassium-lowering medications, patients taking medications sensitive to serum potassium concentrations). Thiazolidinediones (TZDs), which are peroxisome proliferator-activated receptor (PPAR)-gamma agonists, can cause dose-related fluid retention, particularly when used in combination with insulin. Fluid retention may lead to or exacerbate heart failure. Patients treated with insulin, including BASAGLAR, and a PPAR-gamma agonist should be observed for signs and symptoms of heart failure. If heart failure develops, it should be managed according to current standards of care, and discontinuation or dose reduction of the PPAR-gamma agonist must be considered. Hypersensitivity and allergic reactions [see Warnings and Precautions (5.5)]. Two clinical trials with BASAGLAR were conducted: one in type 1 diabetes and one in type 2 diabetes. The type 1 diabetes population had the following characteristics: Mean age was 41 years and mean duration of diabetes was 16 years. 58% were male. 75% were Caucasian, 2% Black or African American and 4% American Indian or Alaskan native. 4% were Hispanic. At baseline, mean eGFR was 109 mL/min/1.73m2. 73.5 percent of patients had eGFR>90 mL/min/1.73m2. The mean BMI was approximately 26 kg/m2. HbA1c at baseline was 7.8%. The data in Table 1 reflect exposure of 268 patients to BASAGLAR with a mean exposure duration of 49 weeks. The type 2 diabetes population had the following characteristics: Mean age was 59 years and mean duration of diabetes was 11 years. 50% were male. 78% were Caucasian, 8% Black or African American and 5% American Indian or Alaskan native. 28% were Hispanic. At baseline, mean eGFR was 109 mL/min/1.73m2. 67.5 percent of patients had eGFR>90 mL/min/1.73m2. The mean BMI was approximately 32 kg/m2. HbA1c at baseline was 8.3%. The data in Table 2 reflect exposure of 376 patients to BASAGLAR with a mean exposure duration of 22 weeks. Common adverse reactions were defined as reactions occurring in ≥5% of the population studied. Common adverse reactions during clinical trials in patients with type 1 diabetes mellitus and type 2 diabetes mellitus (other than hypoglycemia) are listed in Table 1 and Table 2, respectively. a Infections other than nasopharyngitis or upper respiratory tract infection. The frequencies of adverse reactions during a clinical trial of 5 years duration with another insulin glargine product, 100 units/mL, in patients with type 2 diabetes mellitus are listed in Table 3. The frequencies of adverse reactions during clinical trials with another insulin glargine product, 100 units/mL, in children and adolescents with type 1 diabetes mellitus are listed in Table 4. Hypoglycemia is the most commonly observed adverse reaction in patients using insulin, including BASAGLAR [see Warnings and Precautions (5.3)]. The rates of reported hypoglycemia depend on the definition of hypoglycemia used, diabetes type, insulin dose, intensity of glucose control, background therapies, and other intrinsic and extrinsic patient factors. For these reasons, comparing rates of hypoglycemia in clinical trials for BASAGLAR with the incidence of hypoglycemia for other products may be misleading and also, may not be representative of hypoglycemia rates that will occur in clinical practice. Severe symptomatic hypoglycemia was defined as an event with symptoms consistent with hypoglycemia requiring the assistance of another person and associated with either a blood glucose below 50 mg/dL (≤56 mg/dL in the 5-year trial and ≤36 mg/dL in the ORIGIN trial) or prompt recovery after oral carbohydrate, intravenous glucose or glucagon administration. The incidence of severe symptomatic hypoglycemia in patients receiving BASAGLAR with type 1 diabetes mellitus and type 2 diabetes mellitus [see Clinical Studies (14)] was 4% at 52 weeks and 1% at 24 weeks, respectively. The incidence of severe symptomatic hypoglycemia in a clinical trial with another insulin glargine product, 100 units/mL, in children and adolescents age 6 to 15 years with type 1 diabetes [see Clinical Studies (14)] was 23% at 26 weeks. Table 5 displays the proportion of patients experiencing severe symptomatic hypoglycemia in another insulin glargine product, 100 units/mL, and Standard Care groups in the ORIGIN Trial [see Clinical Studies (14)]. Some patients taking insulin therapy, including BASAGLAR have experienced erythema, local edema, and pruritus at the site of injection. These conditions were usually self-limiting. Severe cases of generalized allergy (anaphylaxis) have been reported [see Warnings and Precautions (5.5)]. Some patients taking BASAGLAR have experienced sodium retention and edema, particularly if previously poor metabolic control is improved by intensified insulin therapy. Administration of insulin subcutaneously, including BASAGLAR, has resulted in lipoatrophy (depression in the skin) or lipohypertrophy (enlargement or thickening of tissue) in some patients [see Dosage and Administration (2.1)]. Weight gain has occurred with some insulin therapies including BASAGLAR and has been attributed to the anabolic effects of insulin and the decrease in glycosuria. In a 52-week study of type 1 diabetes patients, 42% of patients who received BASAGLAR once daily were positive for anti-drug antibodies (ADA) at least once during the study, including 17% that were positive at baseline and 25% of patients who developed ADA during the study. Sixty-five percent of the ADA positive patients on BASAGLAR with antibody testing at week 52 remained ADA positive at week 52. In a 24-week study of type 2 diabetes patients, 17% of patients who received BASAGLAR once daily were positive for ADA at least once during the study. Among the subjects who were positive, 5% had ADA at baseline and 12% developed antibodies during the study. The percent binding of patients positive at baseline on BASAGLAR did not increase significantly during the study. Fifty-one percent of the ADA positive patients on BASAGLAR with antibody testing at week 24 remained ADA positive at week 24. There was no evidence that these antibodies had an impact on efficacy and safety outcomes. The detection of antibody formation is highly dependent on the sensitivity and specificity of the assay and may be influenced by several factors such as: assay methodology, sample handling, timing of sample collection, concomitant medication, and underlying disease. For these reasons, comparison of the incidence of antibodies to BASAGLAR with the incidence of antibodies in other studies or to other products may be misleading. The following adverse reactions have been identified during post-approval use of another insulin glargine product, 100 units/mL. Medication errors have been reported in which other insulin products, particularly rapid-acting insulins, have been accidentally administered instead of an insulin glargine product. To avoid medication errors between insulin glargine products and other insulin products, patients should be instructed to always verify the insulin label before each injection. Intervention: Dose reductions and increased frequency of glucose monitoring may be required when BASAGLAR is co-administered with these drugs. Intervention: Dose increases and increased frequency of glucose monitoring may be required when BASAGLAR is co-administered with these drugs. Intervention: Dose adjustment and increased frequency of glucose monitoring may be required when BASAGLAR is co-administered with these drugs. Intervention: Increased frequency of glucose monitoring may be required when BASAGLAR is co-administered with these drugs. Published studies with use of insulin glargine products during pregnancy have not reported a clear association with insulin glargine products and adverse developmental outcomes (see Data). There are risks to the mother and fetus associated with poorly controlled diabetes in pregnancy (see Clinical Considerations). In animal reproduction studies, another insulin glargine product was administered to rats before, during and throughout pregnancy at doses up to 7 times the clinical dose of 10 units/day and to rabbits during organogenesis at doses approximately 2 times the clinical dose of 10 units/day. The effects of this other insulin glargine product did not generally differ from those observed with regular human insulin in rats or rabbits (see Data). The estimated background risk of major birth defects is 6-10% in women with pre-gestational diabetes with a HbA1c >7 and has been reported to be as high as 20-25% in women with a HbA1c >10. The estimated background risk of miscarriage for the indicated population is unknown. In the US general population, the estimated background risk of major birth defects and miscarriage in clinically recognized pregnancies is 2-4% and 15-20%, respectively. Published data do not report a clear association with insulin glargine products and major birth defects, miscarriage, or adverse maternal or fetal outcomes when insulin glargine products are used during pregnancy. However, these studies cannot definitely establish the absence of any risk because of methodological limitations including small sample size and some with no comparative group. Subcutaneous reproduction and teratology studies have been performed with another insulin glargine product and with regular human insulin in rats and Himalayan rabbits. This other insulin glargine product was given to female rats before mating, during mating, and throughout pregnancy at dose up to 0.36 mg/kg/day, which is approximately 7 times the recommended human subcutaneous starting dose of 10 units/day (0.008 mg/kg/day) based on mg/m2. In rabbits, doses of 0.072 mg/kg/day, which is approximately 2 times the recommended human subcutaneous starting dose of 10 units/day (0.008 mg/kg/day), based on mg/m2, were administered during organogenesis. The effects of this other insulin glargine product did not generally differ from those observed with regular human insulin in rats and rabbits. However, in rabbits, five fetuses from two litters of the high-dose group exhibited dilation of the cerebral ventricles. Fertility and early embryonic development appeared normal. There are no data on the presence of insulin glargine in human milk, the effects on the breastfed infant, or the effects on milk production. Endogenous insulin is present in human milk. The developmental and health benefits of breastfeeding should be considered along with the mother's clinical need for BASAGLAR and any potential adverse effects on the breastfed child from BASAGLAR or from the underlying maternal condition. The safety and effectiveness of BASAGLAR have been established in pediatric patients (age 6 to 15 years) with type 1 diabetes based on an adequate and well-controlled trial of another insulin glargine product, 100 units/mL, in pediatric patients (age 6 to 15 years) with type 1 diabetes and additional data in adults with type 1 diabetes [see Clinical Studies (14.2)]. The safety and effectiveness of BASAGLAR in pediatric patients younger than 6 years of age with type 1 diabetes and pediatric patients with type 2 diabetes has not been established. The dosage recommendation when changing to BASAGLAR in pediatric patients (age 6 to 15 years) with type 1 diabetes is the same as that described for adults [see Dosage and Administration (2.3, 2.4) and Clinical Studies (14)]. As in adults, the dosage of BASAGLAR must be individualized in pediatric patients (age 6 to 15 years) with type 1 diabetes based on metabolic needs and frequent monitoring of blood glucose. In the pediatric clinical trial, pediatric patients (age 6 to 15 years) with type 1 diabetes had a higher incidence of severe symptomatic hypoglycemia compared to the adults in trials with type 1 diabetes [see Adverse Reactions (6.1)]. Of the total number of subjects in clinical studies of patients with type 2 diabetes who were treated with BASAGLAR or another insulin glargine product, 100 units/mL, each in combination with oral agents in a controlled clinical trial environment, 28.3% were 65 and over, while 4.5% were 75 and over. No overall differences in safety or effectiveness were observed between these subjects and younger subjects, and other reported clinical experience has not identified differences in responses between the elderly and younger patients, but greater sensitivity of some older individuals cannot be ruled out. Nevertheless, caution should be exercised when BASAGLAR is administered to geriatric patients. In elderly patients with diabetes, the initial dosing, dose increments, and maintenance dosage should be conservative to avoid hypoglycemic reactions. Hypoglycemia may be difficult to recognize in the elderly. The effect of renal impairment on the pharmacokinetics of BASAGLAR has not been studied. Some studies with human insulin have shown increased circulating levels of insulin in patients with renal failure. Frequent glucose monitoring and dose adjustment may be necessary for BASAGLAR in patients with renal impairment [see Warnings and Precautions (5.3)]. The effect of hepatic impairment on the pharmacokinetics of BASAGLAR has not been studied. However, as with all insulin products, more frequent glucose monitoring and dose adjustment may be necessary for BASAGLAR in patients with hepatic impairment [see Warnings and Precautions (5.3)]. In controlled clinical trials, subgroup analyses based on BMI did not show differences in safety and efficacy between BASAGLAR and another insulin glargine product, 100 units/mL. Excess insulin administration relative to food intake, energy expenditure, or both may lead to severe and sometimes prolonged and life-threatening hypoglycemia and hypokalemia [see Warnings and Precautions (5.3, 5.6)]. Mild episodes of hypoglycemia can be treated with oral glucose. Adjustments in drug dosage, meal patterns, or physical activity level may be needed. More severe episodes with coma, seizure, or neurologic impairment may be treated with intramuscular/subcutaneous glucagon or concentrated intravenous glucose. Sustained carbohydrate intake and observation may be necessary because hypoglycemia may recur after apparent clinical recovery. Hypokalemia must be corrected appropriately. BASAGLAR is a clear, colorless, sterile aqueous solution of insulin glargine. Each milliliter of BASAGLAR (insulin glargine injection) contains 100 units (3.6378 mg) insulin glargine. The 3 mL BASAGLAR KwikPen contains the following inactive ingredients per mL: 30 mcg zinc, 2.7 mg metacresol, 17 mg glycerin, and water for injection. The pH is adjusted by addition of aqueous solutions of hydrochloric acid and sodium hydroxide. BASAGLAR has a pH of approximately 4. The pharmacodynamic profile for BASAGLAR was determined after subcutaneous administration of a single 0.5 U/kg dose in a euglycemic clamp study conducted in 91 healthy subjects. The median time to maximum effect of BASAGLAR (measured by the peak rate of glucose infusion) was approximately 12.0 hours. The pharmacodynamic profile of BASAGLAR following subcutaneous injection demonstrated sustained glucose lowering activity over 24 hours with no pronounced peak. The mean area under the glucose infusion rate curves (measure of overall pharmacodynamic effect) and maximum glucose infusion rate were 1670 mg/kg and 2.12 mg/kg/min, respectively. A euglycemic clamp study in 20 patients with type 1 diabetes showed a similar pharmacodynamic profile with a sustained glucose lowering activity over 24 hours following a single 0.3 U/kg subcutaneous dose of BASAGLAR. After subcutaneous injection of 0.3 units/kg of another insulin glargine product, 100 units/mL, in patients with type 1 diabetes, the duration of action after abdominal, deltoid, or thigh subcutaneous administration was similar. The time course of action of insulins, including insulin glargine, may vary between individuals and within the same individual. The pharmacokinetic profile for BASAGLAR was determined after subcutaneous administration of a single 0.5 U/kg dose in a euglycemic clamp study conducted in 91 healthy subjects. The insulin serum concentrations indicated a slow and prolonged absorption and a relatively constant concentration/time profile over 24 hours with no pronounced peak. The median time to maximum serum insulin concentration was 12 hours after injection. On average, serum insulin concentrations declined to baseline by approximately 24 hours. The mean observed area under the serum insulin concentration-time curve from time zero to 24 hours and peak serum insulin concentration were 1720 pmol*hr/L and 103 pmol/L, respectively. After subcutaneous injection of another insulin glargine product, 100 units/mL, in diabetic patients, insulin glargine is metabolized at the carboxyl terminus of the Beta chain with formation of two active metabolites M1 (21A-Gly-insulin) and M2 (21A-Gly-des-30B-Thr-insulin). The in vitro activity of M1 and M2 were similar to that of insulin. Age, Race, and Gender: Effect of age, race, and gender on the pharmacokinetics of BASAGLAR has not been evaluated. Obesity: Effect of BMI on the pharmacokinetics of BASAGLAR has not been evaluated. In mice and rats, standard two-year carcinogenicity studies with another insulin glargine product were performed at doses up to 0.455 mg/kg, which was for the rat approximately 10 times and for the mouse approximately 5 times the recommended human subcutaneous starting dose of 10 units/day (0.008 mg/kg/day), based on mg/m2. The findings in female mice were not conclusive due to excessive mortality in all dose groups during the study. Histiocytomas were found at injection sites in male rats (statistically significant) and male mice (not statistically significant) in acid vehicle containing groups. These tumors were not found in female animals, in saline control, or insulin comparator groups using a different vehicle. The relevance of these findings to humans is unknown. Another insulin glargine product was not mutagenic in tests for detection of gene mutations in bacteria and mammalian cells (Ames- and HGPRT-test) and in tests for detection of chromosomal aberrations (cytogenetics in vitro in V79 cells and in vivo in Chinese hamsters). In a combined fertility and prenatal and postnatal study of another insulin glargine product in male and female rats at subcutaneous doses up to 0.36 mg/kg/day, which was approximately 7 times the recommended human subcutaneous starting dose of 10 units/day (0.008 mg/kg/day), based on mg/m2, maternal toxicity due to dose-dependent hypoglycemia, including some deaths, was observed. Consequently, a reduction of the rearing rate occurred in the high-dose group only. Similar effects were observed with NPH insulin. The safety and effectiveness of another insulin glargine product, 100 units/mL, given once-daily at bedtime was compared to that of once-daily and twice-daily NPH insulin in open-label, randomized, active-controlled, parallel studies of 2,327 adults and 349 pediatric patients with type 1 diabetes mellitus and 1,563 adult patients with type 2 diabetes mellitus (see Tables 8, 9, 11, and 12). In general, the reduction in glycated hemoglobin (HbA1c) with this other insulin glargine product was similar to that with NPH insulin. Patients with inadequately controlled type 1 diabetes participated in a 24-week open-label, active-controlled study with a 28 week extension to evaluate the glucose lowering effect of once-daily BASAGLAR compared to that of once-daily administration of another insulin glargine product, 100 units/mL, or a non-U.S.-approved insulin glargine product, 100 units/mL, (comparator insulin glargine products, 100 units/mL) both in combination with mealtime insulin lispro. Randomized were 535 adults with type 1 diabetes. Mean age was 41.2 years and mean duration of diabetes was 16.39 years. 57.9% were male. 74.5% were Caucasian, 2.1% Black or African American and 4.3% American Indian or Alaskan native. 3.9% were Hispanic. 73.5 percent of patients had GFR>90 mL/min/1.73m2. The mean BMI was approximately 25.54 kg/m2. At week 24, treatment with BASAGLAR provided a mean reduction in HbA1c that was non-inferior to that achieved with comparator insulin glargine products, 100 units/mL (see Table 7). a One patient randomized to the BASAGLAR group was not included in the Full Analysis Set. b “Comparator insulin glargine products, 100 units/mL” refers to another insulin glargine product, 100 units/mL, and a non-U.S.-approved insulin glargine product, 100 units/mL, used in this study. c ANCOVA Model includes treatment, country and time of baseline basal insulin injection (daytime or evening/bedtime) as fixed effects and baseline HbA1c as covariate. d The results were calculated based on the number of patients in the Full Analysis Set using their last observed post-baseline value of HbA1c. Observed HbA1c data at 24 weeks were available from 256 (95.5%) and 258 (96.6%) subjects randomized to the BASAGLAR and comparator insulin glargine products, 100 units/mL, groups, respectively. In two clinical studies (Studies A and B), patients with type 1 diabetes (Study A; n=585, Study B; n=534) were randomized to 28 weeks of basal-bolus treatment with another insulin glargine product, 100 units/mL, or NPH insulin. Regular human insulin was administered before each meal. This other insulin glargine product was administered at bedtime. NPH insulin was administered once daily at bedtime or in the morning and at bedtime when used twice daily. In Study A, the average age was 39.2 years. The majority of patients were Caucasian (99%) and 55.7% were male. The mean BMI was approximately 24.9 kg/m2. The mean duration of diabetes was 15.5 years. In Study B, the average age was 38.5 years. The majority of patients were Caucasian (95.3%) and 50.6% were male. The mean BMI was approximately 25.8 kg/m2. The mean duration of diabetes was 17.4 years. In another clinical study (Study C), patients with type 1 diabetes (n=619) were randomized to 16 weeks of basal-bolus treatment with another insulin glargine product, 100 units/mL, or NPH insulin. Insulin lispro was used before each meal. This other insulin glargine product was administered once daily at bedtime and NPH insulin was administered once or twice daily. The average age was 39.2 years. The majority of patients were Caucasian (96.9%) and 50.6% were male. The mean BMI was approximately 25.6 kg/m2. The mean duration of diabetes was 18.5 years. In these 3 studies, another insulin glargine product, 100 units/mL, and NPH insulin had similar effects on HbA1c (see Table 8) with a similar overall rate of hypoglycemia [see Adverse Reactions (6.1)]. The efficacy of BASAGLAR to improve glycemic control in pediatric patients with type 1 diabetes mellitus is based on an adequate and well-controlled trial of another insulin glargine product, 100 units/mL, in pediatric patients with type 1 diabetes mellitus (Study D). In this randomized, active-controlled clinical study (Study D), pediatric patients (age range 6 to 15 years) with type 1 diabetes (n=349) were treated for 28 weeks with a basal-bolus insulin regimen where regular human insulin was used before each meal. Patients were randomized to either this other insulin glargine product administered once daily at bedtime or NPH insulin administered once or twice daily. The average age was 11.7 years. The majority of patients were Caucasian (96.8%) and 51.9% were male. The mean BMI was approximately 18.9 kg/m2. The mean duration of diabetes was 4.8 years. Similar effects on HbA1c (see Table 9) were observed in both treatment groups. Patients with type 2 diabetes participated in a double-blind, active-controlled study to evaluate the glucose lowering effect of once-daily BASAGLAR plus oral antidiabetic medication (OAM) compared to that of another insulin glargine product, 100 units/mL, or a non-U.S.-approved insulin glargine product, 100 units/mL (comparator insulin glargine products, 100 units/mL) administered once-daily along with OAMs. Patients were either insulin naïve (approximately 60%) and had failed to achieve adequate glycemic control on at least 2 OAMs, or were already on another insulin glargine product, 100 units/mL, or a non-U.S.-approved insulin glargine product, 100 units/mL, along with at least 2 OAMs with adequate or inadequate glycemic control (approximately 40%). A total of 759 patients were randomized. Three patients randomized to BASAGLAR did not receive study drug and were not included in efficacy analysis. The average age was approximately 59 years. The majority of patients were White (78%) and 50% of the patients were male. Sixty-eight percent of patients had GFR>90 mL/min/1.73m2. The mean BMI was approximately 32 kg/m2. At week 24, treatment with BASAGLAR provided a mean reduction in HbA1c that was non-inferior to that achieved with comparator insulin glargine products, 100 units/mL (see Table 10). a Three patients randomized to BASAGLAR did not receive study drug and were not included in the Full Analysis Set. c ANCOVA Model includes treatment, country, sulfonylurea use and time of baseline basal insulin injection (daytime or evening/bedtime) as fixed effects and baseline HbA1c as covariate. d The results were calculated based on the number of patients in the Full Analysis Set using their last observed post-baseline value of HbA1c. Observed HbA1c data at 24 weeks were available from 331 (88%) and 329 (87%) subjects randomized to the BASAGLAR and comparator insulin glargine products, 100 units/mL, groups, respectively. In a randomized, controlled clinical study (Study E) (n=570), another insulin glargine product, 100 units/mL, was evaluated for 52 weeks in combination with oral anti-diabetic medications (a sulfonylurea, metformin, acarbose, or combination of these drugs). The average age was 59.5 years. The majority of patients were Caucasian (92.8%) and 53.7% were male. The mean BMI was approximately 29.1 kg/m2. The mean duration of diabetes was 10.3 years. This other insulin glargine product administered once daily at bedtime was as effective as NPH insulin administered once daily at bedtime in reducing HbA1c and fasting glucose (see Table 11). The rate of hypoglycemia was similar in this other insulin glargine product and NPH insulin treated patients [see Adverse Reactions (6.1)]. In a randomized, controlled clinical study (Study F), in patients with type 2 diabetes not using oral anti-diabetic medications (n=518), a basal-bolus regimen of another insulin glargine product, 100 units/mL, once daily at bedtime or NPH insulin administered once or twice daily was evaluated for 28 weeks. Regular human insulin was used before meals, as needed. The average age was 59.3 years. The majority of patients were Caucasian (80.7%) and 60% were male. The mean BMI was approximately 30.5 kg/m2. The mean duration of diabetes was 13.7 years. This other insulin glargine product had similar effectiveness as either once- or twice daily NPH insulin in reducing HbA1c and fasting glucose (see Table 11) with a similar incidence of hypoglycemia [see Adverse Reactions (6.1)]. In a randomized, controlled clinical study (Study G), patients with type 2 diabetes were randomized to 5 years of treatment with another insulin glargine product, 100 units/mL, once-daily or twice-daily NPH insulin. For patients not previously treated with insulin, the starting dose of this other insulin glargine product or NPH insulin was 10 units daily. Patients who were already treated with NPH insulin either continued on the same total daily NPH insulin dose or started this other insulin glargine product at a dose that was 80% of the total previous NPH insulin dose. The primary endpoint for this study was a comparison of the progression of diabetic retinopathy by 3 or more steps on the ETDRS scale. HbA1c change from baseline was a secondary endpoint. Similar glycemic control in the 2 treatment groups was desired in order to not confound the interpretation of the retinal data. Patients or study personnel used an algorithm to adjust this other insulin glargine product and NPH insulin doses to a target fasting plasma glucose ≤100 mg/dL. After this other insulin glargine product or NPH insulin dose was adjusted, other anti-diabetic agents, including pre-meal insulin were to be adjusted or added. The average age was 55.1 years. The majority of patients were Caucasian (85.3%) and 53.9% were male. The mean BMI was approximately 34.3 kg/m2. The mean duration of diabetes was 10.8 years. This other insulin glargine product group had a smaller mean reduction from baseline in HbA1c compared to the NPH insulin group, which may be explained by the lower daily basal insulin doses in this other insulin glargine product group (see Table 11). Both treatment groups had a similar incidence of reported symptomatic hypoglycemia. The incidence of severe symptomatic hypoglycemia in the ORIGIN Trial is given in Table 5 [see Adverse Reactions (6.1)]. The safety and efficacy of this other insulin glargine product administered pre-breakfast, pre-dinner, or at bedtime were evaluated in a randomized, controlled clinical study in patients with type 1 diabetes (Study H; n=378). Patients were also treated with insulin lispro at mealtime. The average age was 40.9 years. All patients were Caucasian (100%) and 53.7% were male. The mean BMI was approximately 25.3 kg/m2. The mean duration of diabetes was 17.3 years. This other insulin glargine product administered at different times of the day resulted in similar reductions in HbA1c compared to that with bedtime administration (see Table 12). In these patients, data are available from 8-point home glucose monitoring. The maximum mean blood glucose was observed just prior to injection of this other insulin glargine product regardless of time of administration. In this study, 5% of patients in this other insulin glargine product-breakfast arm discontinued treatment because of lack of efficacy. No patients in the other two arms discontinued for this reason. The safety and efficacy of this other insulin glargine product administered pre-breakfast or at bedtime were also evaluated in a randomized, active-controlled clinical study (Study I, n=697) in patients with type 2 diabetes not adequately controlled on oral anti-diabetic therapy. All patients in this study also received glimepiride 3 mg daily. The average age was 60.8 years. The majority of patients were Caucasian (96.6%) and 53.7% were male. The mean BMI was approximately 28.7 kg/m2. The mean duration of diabetes was 10.1 years. This other insulin glargine product given before breakfast was at least as effective in lowering HbA1c as this other insulin glargine product given at bedtime or NPH insulin given at bedtime (see Table 12). b Total number of patients evaluable for safety. Retinopathy was evaluated in clinical studies with another insulin glargine product, 100 units/mL, by analysis of reported retinal adverse events and fundus photography. The numbers of retinal adverse events reported for this other insulin glargine product and NPH insulin treatment groups were similar for patients with type 1 and type 2 diabetes. Another insulin glargine product, 100 units/mL, was compared to NPH insulin in a 5-year randomized clinical trial that evaluated the progression of retinopathy as assessed with fundus photography using a grading protocol derived from the Early Treatment Diabetic Retinopathy Scale (ETDRS). Patients had type 2 diabetes (mean age 55 years) with no (86%) or mild (14%) retinopathy at baseline. Mean baseline HbA1c was 8.4%. The primary outcome was progression by 3 or more steps on the ETDRS scale at study endpoint. Patients with pre-specified post-baseline eye procedures (pan-retinal photocoagulation for proliferative or severe nonproliferative diabetic retinopathy, local photocoagulation for new vessels, and vitrectomy for diabetic retinopathy) were also considered as 3-step progressions regardless of actual change in ETDRS score from baseline. Retinopathy graders were blinded to treatment group assignment. The results for the primary endpoint are shown in Table 13 for both the per-protocol and Intent-to-Treat populations, and indicate similarity of this other insulin glargine product to NPH in the progression of diabetic retinopathy as assessed by this outcome. a Difference = another insulin glargine product, 100 units/mL – NPH. b Using a generalized linear model (SAS GENMOD) with treatment and baseline HbA1c strata (cutoff 9.0%) as the classified independent variables, and with binomial distribution and identity link function. The Outcome Reduction with Initial Glargine Intervention trial (i.e., ORIGIN) was an open-label, randomized, 2-by-2, factorial design study. One intervention in ORIGIN compared the effect of another insulin glargine product, 100 units/mL, to standard care on major adverse cardiovascular outcomes in 12,537 participants ≥50 years of age with abnormal glucose levels [i.e., impaired fasting glucose (IFG) and/or impaired glucose tolerance (IGT)] or early type 2 diabetes mellitus and established cardiovascular (i.e., CV) disease or CV risk factors at baseline. The objective of the trial was to demonstrate that use of this other insulin glargine product could significantly lower the risk of major cardiovascular outcomes compared to standard care. Two co-primary composite cardiovascular endpoints were used in ORIGIN. The first co-primary endpoint was the time to first occurrence of a major adverse cardiovascular event defined as the composite of CV death, nonfatal myocardial infarction and nonfatal stroke. The second co-primary endpoint was the time to the first occurrence of CV death or nonfatal myocardial infarction or nonfatal stroke or revascularization procedure or hospitalization for heart failure. Participants were randomized to either this other insulin glargine product (N=6264) titrated to a goal fasting plasma glucose of ≤95 mg/dL or to standard care (N=6273). Anthropometric and disease characteristics were balanced at baseline. The mean age was 64 years and 8% of participants were 75 years of age or older. The majority of participants were male (65%). Fifty nine percent were Caucasian, 25% were Latin, 10% were Asian and 3% were Black. The median baseline BMI was 29 kg/m2. Approximately 12% of participants had abnormal glucose levels (IGT and/or IFG) at baseline and 88% had type 2 diabetes. For patients with type 2 diabetes, 59% were treated with a single oral antidiabetic drug, 23% had known diabetes but were on no antidiabetic drug and 6% were newly diagnosed during the screening procedure. The mean HbA1c (SD) at baseline was 6.5% (1.0). Fifty nine percent of participants had had a prior cardiovascular event and 39% had documented coronary artery disease or other cardiovascular risk factors. Vital status was available for 99.9% and 99.8% of participants randomized to this other insulin glargine product and standard care respectively at end of trial. The median duration of follow-up was 6.2 years [range: 8 days to 7.9 years]. The mean HbA1c (SD) at the end of the trial was 6.5% (1.1) and 6.8% (1.2) in this other insulin glargine product and standard group respectively. The median dose of this other insulin glargine product at end of trial was 0.45 U/kg. Eighty-one percent of patients randomized to this other insulin glargine product were using this other insulin glargine product at end of the study. The mean change in body weight from baseline to the last treatment visit was 2.2 kg greater in this other insulin glargine group than in the standard care group. In the ORIGIN trial, the overall incidence of cancer (all types combined) or death from cancer in the ORIGIN trial (see Table 15) was similar between treatment groups. This device is recommended for use with Becton, Dickinson & Company's insulin pen needles which are sold separately. Do not freeze BASAGLAR. Do not use BASAGLAR if it has been frozen. BASAGLAR must be protected from direct heat and light. 3 mL BASAGLAR KwikPen (prefilled) 28 days Until expiration date 28 days, Do not refrigerate. Advise patients that they must never share a BASAGLAR KwikPen with another person, even if the needle is changed, because doing so carries a risk for transmission of blood-borne pathogens [see Warnings and Precautions (5.1)]. Advise patients that changes in insulin regimen can predispose to hyper- or hypoglycemia. Advise patients that changes in insulin regimen should be made under close medical supervision [see Warnings and Precautions (5.2)]. Inform patients to always check the insulin label before each injection [see Warnings and Precautions (5.4)]. BASAGLAR must only be used if the solution is clear and colorless with no particles visible. Patients must be advised that BASAGLAR must NOT be diluted or mixed with any other insulin or solution [see Dosage and Administration (2.1)]. Patients should be instructed on self-management procedures including glucose monitoring, proper injection technique, and management of hypoglycemia and hyperglycemia. Patients must be instructed on handling of special situations such as intercurrent conditions (illness, stress, or emotional disturbances), an inadequate or skipped insulin dose, inadvertent administration of an increased insulin dose, inadequate food intake, and skipped meals [see Warnings and Precautions (5.3)]. Refer patients to the BASAGLAR “Patient Information” for additional information about the potential side effects of insulin therapy, including lipodystrophy (and the need to rotate injection sites within the same body region), weight gain, allergic reactions, and hypoglycemia. Copyright © 2015, 2018, Eli Lilly and Company. All rights reserved. BASAGLAR is a long-acting man made insulin used to control high blood sugar in adults and children with type 1 diabetes mellitus and adults with type 2 diabetes mellitus. BASAGLAR is not for use to treat diabetic ketoacidosis. It is not known if BASAGLAR is safe and effective in children less than 6 years of age with type 1 diabetes mellitus or in children with type 2 diabetes mellitus. Who should not use BASAGLAR? have an allergy to insulin glargine or any of the ingredients in BASAGLAR. See the end of this Patient Information leaflet for a complete list of ingredients in BASAGLAR. What should I tell my healthcare provider before using BASAGLAR? have heart failure or other heart problems. If you have heart failure, it may get worse while you take TZDs with BASAGLAR. are pregnant, planning to become pregnant, or are breastfeeding. It is not known if BASAGLAR may harm your unborn or breastfeeding baby. Before you start using BASAGLAR, talk to your healthcare provider about low blood sugar and how to manage it. Read the detailed Instructions for Use that come with your BASAGLAR. Use BASAGLAR exactly as your healthcare provider tells you to. Your healthcare provider should tell you how much BASAGLAR to use and when to use it. Know the amount of BASAGLAR you use. Do not change the amount of BASAGLAR you use unless your healthcare provider tells you to. BASAGLAR may be used at any time during the day, but BASAGLAR should be used at the same time each day. Only use BASAGLAR that is clear and colorless. If your BASAGLAR is cloudy or slightly colored, return it to your pharmacy for a replacement. BASAGLAR is injected under your skin (subcutaneously). Do not use BASAGLAR in an insulin pump or inject BASAGLAR into your vein (intravenously). 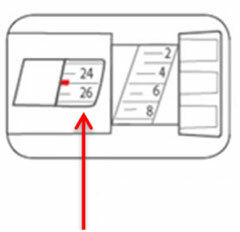 Change (rotate) your injection sites within the area you chose with each dose. Do not use the exact spot for each injection. Do not mix BASAGLAR with any other type of insulin. Do not share your BASAGLAR® KwikPen® with other people, even if the needle has been changed. You may give other people a serious infection or get a serious infection from them. Keep BASAGLAR and all medicines out of the reach of children. drive or operate heavy machinery, until you know how BASAGLAR affects you. What are the possible side effects of BASAGLAR? Treatment with TZDs and BASAGLAR may need to be changed or stopped by your healthcare provider if you have new or worse heart failure. low blood sugar (hypoglycemia), allergic reactions, including reactions at the injection site, skin thickening or pits at the injection site (lipodystrophy). These are not all the possible side effects of BASAGLAR. Call your doctor for medical advice about side effects. You may report side effects to FDA at 1-800-FDA-1088 (1-800-332-1088). General information about the safe and effective use of BASAGLAR. Medicines are sometimes prescribed for purposes other than those listed in a Patient Information leaflet. Do not use BASAGLAR for a condition for which it was not prescribed. Do not give BASAGLAR to other people, even if they have the same symptoms that you have. It may harm them. This Patient Information leaflet summarizes the most important information about BASAGLAR. If you would like more information, talk with your healthcare provider. You can ask your pharmacist or healthcare provider for information about BASAGLAR that is written for health professionals. For more information, go to www.basaglar.com or call 1-800-545-5979. What are the ingredients in BASAGLAR? Inactive ingredients: zinc, metacresol, glycerin and water for injection as inactive ingredients. Hydrochloric acid and/or sodium hydroxide may be added to adjust the pH. Copyright © 2015, 2016, Eli Lilly and Company. All rights reserved. Read the Instructions for Use before you start using BASAGLAR and each time you get another BASAGLAR® KwikPen®. There may be new information. This information does not take the place of talking to your healthcare provider about your medical condition or your treatment. Do not share your BASAGLAR KwikPen with other people, even if the needle has been changed. You may give other people a serious infection or get a serious infection from them. 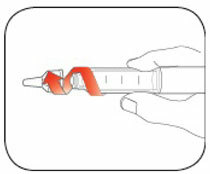 BASAGLAR KwikPen ("Pen") is a disposable prefilled pen containing 300 units (3mL) of BASAGLAR. One pen contains multiple doses of medicine. Your healthcare provider will tell you how many units to give as your dose and how to inject your prescribed dose of medicine. You can give a dose of 1 to 80 units in a single injection. If your prescribed dose is more than 80 units, you will need to give yourself more than 1 injection. 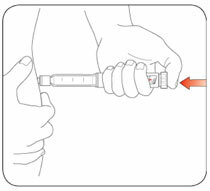 The plunger only moves a little with each injection, and you may not notice that it moves. When the plunger reaches the end of the cartridge, you have used all 300 units in the Pen. - Do not remove the Pen Label. Check the liquid in the Pen. BASAGLAR should look clear and colorless. Do not use if it is cloudy, colored, or has particles or clumps in it. Pull off the Outer Needle Shield. Priming means removing the air from the Needle and Cartridge that may collect during normal use. It is important to prime your Pen before each injection so that it will work correctly. - If you do not see insulin, repeat the priming steps, but not more than 4 times. - If you still do not see insulin, change the Needle and repeat the priming steps. If your dose is more than 80 units, you will need to give more than 1 injection. - Talk to your healthcare provider about how to give your dose. - Use a new Needle for each injection and repeat the priming step. - The Pen dials 1 unit at a time. - The Dose Knob clicks as you turn it. - Do not dial your dose by counting the clicks because you may dial the wrong dose. 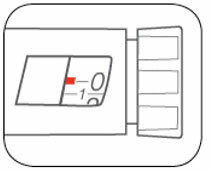 - The dose can be corrected by turning the Dose Knob in either direction until the correct dose lines up with the Dose Indicator. - The even numbers are printed on the dial. - The odd numbers, after the number 1, are shown as full lines. - get a new Pen and inject the full dose. BASAGLAR is injected under the skin (subcutaneously) of your stomach area, buttocks, upper legs or upper arms. Note: Do not try to inject your insulin by turning the Dose Knob. You will not receive your insulin by turning the Dose Knob. - A drop of insulin at the Needle tip is normal. It will not affect your dose. - If you see “0” in the Dose Window, you have received the full amount you dialed. - If you do not see “0” in the Dose Window you did not receive your full dose. Do not redial. Insert the needle into your skin and finish your injection. - If you still do not think you received the full amount you dialed for your injection, do not start over or repeat that injection. Monitor your blood glucose and call your healthcare provider for further instructions. - If you normally need to give 2 injections for your full dose, be sure to give your second injection. 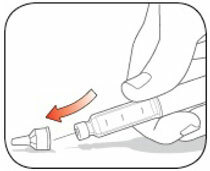 Unscrew the capped Needle and throw it away (see Disposing of Pens and Needles section below). - properly labeled to warn of hazardous waste inside the container. Do not freeze BASAGLAR. Do not use if it has been frozen. Store the Pen you are currently using at room temperature [up to 86°F (30°C)] and away from heat and light. Do not share your Pen or needles with other people. You may give other people a serious infection or get a serious infection from them. - Pushing the Dose Knob more slowly will make it easier to inject. - Your Needle may be blocked. Put on a new Needle and prime the Pen. - You may have dust, food, or liquid inside the Pen. Throw the Pen away and get a new Pen. If you have any questions or problems with your BASAGLAR KwikPen, contact Lilly at 1-800-LillyRx (1-800-545-5979) or call your healthcare provider for help. For more information on BASAGLAR KwikPen and insulin, go to www.basaglar.com. BASAGLAR® and BASAGLAR® KwikPen® are trademarks of Eli Lilly and Company. BASAGLAR KwikPen meets the current dose accuracy and functional requirements of ISO 11608-1:2014. Read Basaglar® KwikPen® Instructions for Use. This device is recommended for use with Becton, Dickinson & Company's insulin pen needles.